Immerse yourself in luxury at Renaissance Orlando at SeaWorld . Our deluxe accommodations and premier location across from SeaWorld and other famous Orlando attractions inspire unforgettable experiences. Well-appointed guest rooms offer ample space for relaxing and boast thoughtful and comfortable amenities for a sound night's sleep or productive business day. 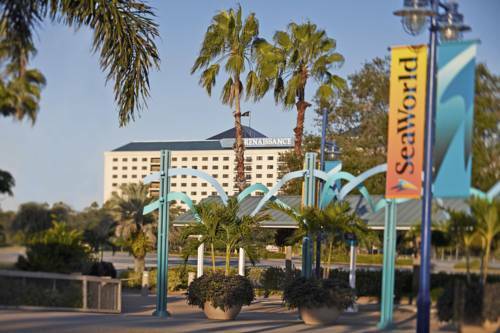 Professionals will appreciate our SeaWorld Orlando hotel's 165,000 square feet of event space for creative meetings. Our flexible event venues are also ideal for celebrations, weddings and receptions. Children can splash around at R Aqua Zone, our on-site waterpark, while adults break a sweat in our state-of-the-art fitness center. Five restaurants, a Starbucks and ice cream shop will please all palates. Pamper yourself in style at the full-service Neu Lotus Spa and enjoy a massage, facial or scrub. Looking to explore Orlando like a local? Ask our friendly Navigator for tips about hidden gems and plan your next big adventure at Renaissance now. If you re looking for the best Japanese restaurant in Orlando, Mist Sushi and Spirits is an excellent choice. Enjoy handcrafted cocktails and sushi so fresh you ll feel like you re seaside- at this acclaimed sushi restaurant near Seaworld Orlando. Unwind and enjoy refreshing beverages and light snacks at this trendy sports bar. With a variety of classic and trendy cocktails plus an assortment of imported and domestic beers, this sports bar stands out among Orlando restaurants near SeaWorld . Indulge in a fresh fruit smoothie, a quick snack, or a light lunch and enjoy complimentary Wi-Fi while relaxing poolside at Palms. Our grill allows you to enjoy a casual lunch before or after a dip in the pool or while basking in warm outdoor sunlight. This full-service Starbucks serves all of your favorite coffee and tea beverages with delicious pastries and bagels. The best soft serve ice cream on the planet! We use only top-of-the-line ingredients. Try our delicious French vanilla bean or chocolate, or twist em up together.